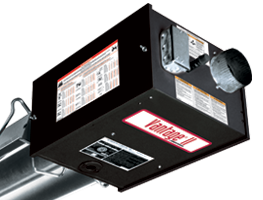 Power burner radiant tube heaters, easy and fast installation, low first cost. Standard Roberts-Gordon three year warranty. 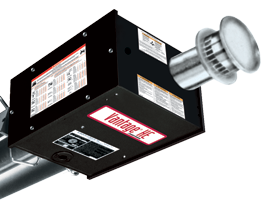 Vantage®II is the industry standard tube heater for quality and performance. 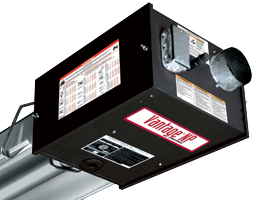 Radiant Tube Heaters with two burners in one housing for better radiant coverage and easier installation. Cuts down on gas and electrical hook-ups to save even more money. 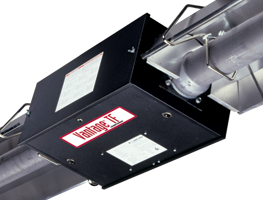 Radiant Tube Heaters for harsh environments and even outdoor use. Aluminized tubing and optional stainless steel reflector. Non-combustion condensing vacuum-fired radiant heating competitively priced for the bidding market. Burner sizes of 80M, 110M, 140M, 170M, 200M. Available with up to six burners sharing a vacuum pump, or in single burner configurations.